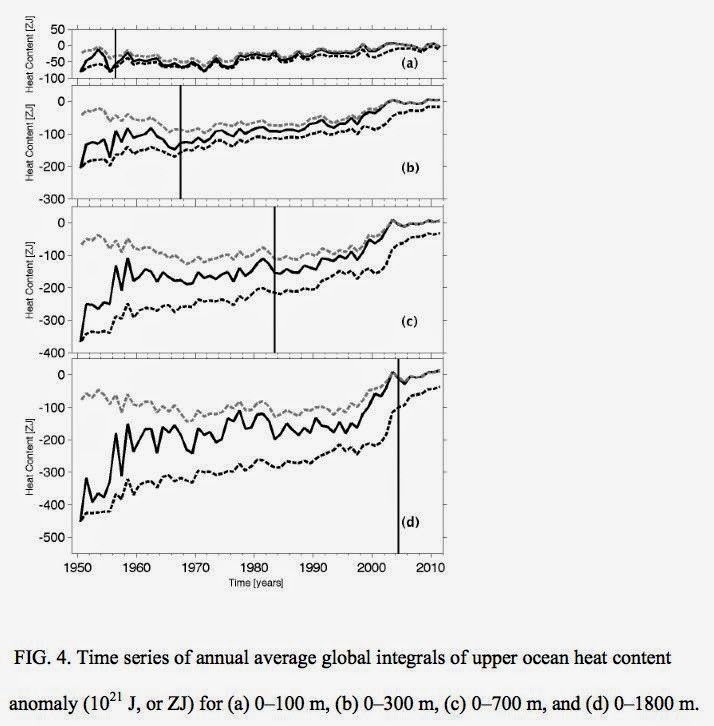 I have several times seen the claim that, despite the apparent pause in surface temperatures, global warming is actually going faster than ever, with the missing heat in the ocean. So far I have seen no support for that claim. I did, however, recently come across an article discussing global heat content changes and problems in estimating them that contains an interesting graph. As best I can tell, the different lines represent different ways of estimating the values, given the data limitations, with data becoming available later for the deeper depths; the vertical lines show, for each depth, the date when global coverage reached 50%. So the bottom graph is the best in terms of how deep it goes, the worst in quality of the data. The pattern seems pretty clear. Slow warming until about 1996, faster from then until about 2004, slower to zero warming thereafter. Correct as far as it goes, but I don't think either side really cares about the amount of recent warming (or even how long the present pause will last). The important thing about the "climate change hypothesis" is the proponents' assertion of an emergency, which implies all of the following. (1) GW/CC, if it continues, will have devastating effects on the planet and imperil the survival of the human race. (2) These catastrophic effects cannot be prevented or alleviated by any method that is easier or cheaper than the sacrifices the alarmists call for us to make now. (3) The Kyoto Protocol and its intended sequels would be enough to prevent the catastrophe. All three of these propositions are very much open to doubt, to say the least, but #2 in particular is long since disproven, not least by Gregory Benford's article in Reason. Couple that with awareness of the real motivations of the major figures in the green movement, as revealed at green-agenda.com, and we can all relegate Global Warming/Climate Change to the junkheap of risks that can and should be ignored, right up there with terrorism (outside the Middle East) (except that committed by the local badge thugs themselves). I think your point 1 overstates what the argument requires. A disaster well short of one that imperils human survival would still be a good argument for doing something, if there was something not too devastating that could be done to stop it. Why Did Putin Invade the Crimea?